Gazebos are one of the best ways to tie together your backyard. Coming in a variety of makes and models, with features to match any arrangement and lifestyle, it’s really hard to go wrong if you’re thinking of adding one in. You do, however, need to find the right one to suit your needs! When picking out a gazebo for your backyard, you should know there are two main varieties. There are canopies and hard-top gazebos. The distinction is that canopies have a covering made out of a soft, flexible fabric or canvas material while the hardtop variety have a solid built roof. There are advantages and disadvantages to each so depending on what your needs are, one might work better than the other. In a nutshell, the hardtop gazebos are heavier duty compared to the canopies. They are built stronger, feature the solid roof as well as solid side paneling in some cases, but may also come with more of an investment in terms of price and effort to install. If endurance is what you seek, the hardtops might be right for you. Otherwise, the canopy type gazebos’ lighter weight design favours versatility, flexibility and ease of setup. Whichever path you may take, however, you will find no scarcity of features or dazzling designs. That is why we’ve put together the current lineup, to explore the gems that we’ve handpicked from a multitude of manufacturers. This one features the best of the best in the world of canopy gazebos. Nothing better to start us off than this beautifully simple yet effective canopy gazebo. The design is simple, yet wonderfully straightforward, making it particularly versatile. Clocking in at 10 by 10 feet, for a total of 100 square feet of coverage, the Ozark Trail Instant Canopy is in that size range that is not too big, not too small, leaving your possibilities for use wide open. The neutral aesthetic and shape allow it to be easily integrated in any backyard setup, while also maintaining a very budget-friendly price. One thing we’ve certainly noticed, is that it truly earns it’s name as an “instant” canopy as the Ozark is incredibly easy to set up. The frame comes with adjustable legs for optimum height as well as a vented roof for better air circulation. Adding to the portability factor, the Ozark is actually made from particularly lightweight materials, and it is collapsible into a wheeled carry bag so you can take it anywhere you please. If you are looking for a canopy that you can also take camping with you, this is the perfect find! Continuing on to another breezy lightweight contender, the Outsunny Triangle Shade Sail delivers very well on a variety of fronts including portability and versatility, as well as coverage and design. The unique “shade sail” concept is very simple and dazzlingly stylish. The shade sail is simply a canopy suspended by nylon ropes tied to D-rings. This format allows it to be unbelievably maneuverable and portable while providing coverage and design aesthetic comparable to a lot of high end canopies. Worth noting as well is the fact that it comes at a more than friendly pricepoint due to the particularly simplistic construct. The canopy material is designed to be mostly opaque, but also ever so slightly see-through, blocking out up to 90% of UV light and being able to maintain the temperature underneath it up to 6.5 degrees cooler. The Z-Shade pop-up canopy gazebo is excellent if you’re looking for a slightly sturdier product without getting into anything too heavyweight. 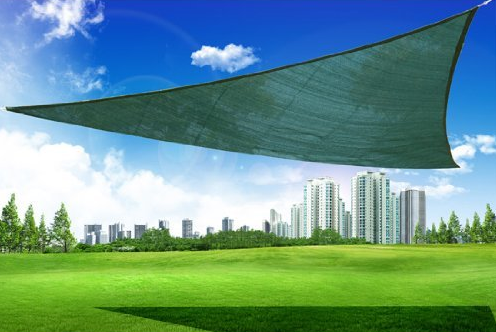 What we really enjoy about the Z-Shade canopy is that in all aspects it is….just right. It features a 13 by 13 foot canopy that is held up to 9.6 feet high (with a 6.6 foot clearance) by an effective steel frame, making it able to bravely endure time as well as the elements. However, despite that the price is not at all inflated and features a fairly compact build weighing in at 59 pounds which is easy to assemble and tear down, hence it’s name as a “pop-up” gazebo. All in all, the Z-Shade speaks for itself being a very well rounded and durable yet moderately priced item with a design that is certainly not lacking in aesthetics. The Abba Square Butterfly Canopy is indeed a specimen to take note of. Clocking in at 12 by 12 feet, with a clearance of around 9 ft, with a UV resistant canopy and propped up by a corrosion resistant frame, this item is certainly a solid investment. What won the Abba Square Butterfly’s way into our hearts, however, is the intriguing frame design. An interesting concept for a canopy, the Butterfly changes it up with its square and angular shape. Also coming with this design is a particularly light build which makes it easy to assemble, place, and move around. 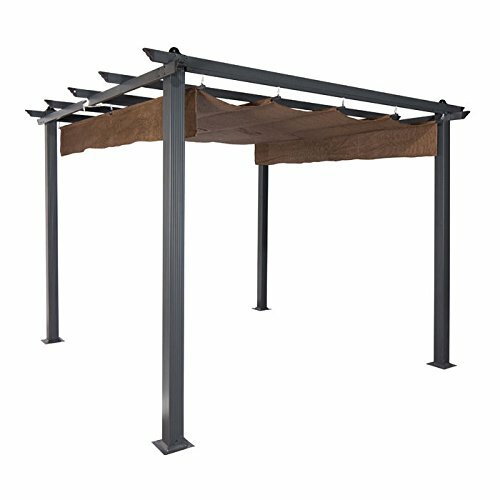 Moving on to the Coolaroo Constantine Pergola, you will notice that our lineup is shifting toward the heavier weight contenders. Built with a slightly thicker and sturdier aluminium frame, which is well equipped to fight off the elements, the Coolaroo impresses through its square and more ‘rough around the edges’ appeal. The extra flat sides make it easy to fit in and snap perfectly into place for the best distribution of coverage. Given the slightly heavier build of this canopy, you would definitely want to get the ideal placement without too much moving around. Stylistically, the Coolaroo Constantine has a delightful rugged yet elegant look about it. The jutting grid-like supports for the canopy give it a harsher look which is complemented by the soft elegance of the fabric hanging gracefully from it, instead of being stretched out fully like most canopies. Adding to the aesthetic is the fact that it comes in multiple different colours, making it easier than ever to integrate into your dream backyard. The Belham Living Steel Pergola is similar to the Coolaroo in it’s rigid square shape, but definitely takes it a step further. Sporting a smooth ‘sleek’ look, this canopy is a solid pick for anyone who dreams about a stylish backyard to impress all the neighbours and friends. Propped up by a durable, rust resistant frame that is slightly larger at 12 by 10 feet, this canopy is perfect for setting up a table or a couple of loveseats for that perfect living room feel. The canopy on this model is actually retractable as well. This makes it one of the easiest canopies to work with. The only thing that could possibly outdo it is the shade sail which has no frame to begin with. Sunjoy is definitely a name that gets around in the world of gazebos. Totaling in size at 10 by 12 feet, this one is also one of the larger gazebos which can easily host a generous array of lawn furniture as well as a chairs-plus-table setup for that outdoor living or dining room feel. What you will notice about this model and many of the canopies sporting the Sunjoy label, is the attention to detail in the design. Gazebos often try to impress users with an assortment of designs, however they are usually centred around the bigger features like the overall shape and colouring, mostly emphasizing the canopy material. Sunjoy strives to leave a more refined impression by tackling the smaller details and making sure they dazzle you and your guests to no end. In the case of the Parlay, it’s all about the poles and the frame holding up the canopy. Across the board, the focus of the frame is usually to be sturdy and to resist the elements, leaving them at the mercy of bland and oversimplified aesthetics. The Parlay brings forth the more intricate L-shaped pillars which are not only a lot more stylish than most, but also allow for much more stability since they are not putting the entire weight on just one point. This, along with the vented canopy (which is standard in most high end gazebos) make the Sunjoy Parlay a headturner to say the least. Continuing on the Sunjoy trend, it should be of no surprise that we are continuing to rave about this brand as spot number three is also taken by a Sunjoy gazebo. This one is the Sunjoy Manila Gazebo. A smaller model than the Parlay, ranking at 8 by 8.5 feet. Perfect for someone looking to start a bit smaller or that is working with a tighter space, the Manila is actually one of the most compact gazebo sizes out there. Nevertheless, it comes with the excellent quality build and simply superb design that is a trademark of the Sunjoy canopies. As we discussed with the Parlay earlier, their signature trait is in the details. The aesthetics of these canopies are thought out and well executed from the larger features all the way to the small, making sure it does nothing less than impress. In the case of the Manila Gazebo, it features the fabric covered poles. While most companies leave their poles bare and focus on the canopy design, this one has the poles wrapped in a beautiful fabric matching its canopy to create a very elegant and well-rounded feel. Switching back to the pergolas, we are going to look at the Doubleton Steel Pergola. Given our streak, we couldn’t help but go on just a little bit more about the Sunjoy brand before calling it a day. (However, we do promise we’ll wrap it up soon). This one is similar to the Belham Living and Coolaroo in the overall design, featuring the trademark jutting poles and more rugged boxy design with a free flowing canopy. What is noteworthy about Sunjoy’s take on this is the adjustable shade. Similar to the Belham build, the Doubleton allows the shade to be moved across the canopy supports to make sure you get the best distribution of shade coverage. What we’ve liked about it more, however, is that it is simpler in concept making the aesthetic easier to integrate into the look of your backyard regardless of what your decor is. Finally in our lineup, we are going to feature the heavyweight. The Seville Gazebo from Systems Trading Corp comes in at 12 by 12 feet with a spectacular height of 10.5 feet. The simple yet stylish build features a deeply arched double canopy, which is actually genuine Sunbrella brand, and a sturdy weather resistant frame. Sturdy and large can be quite the understatements in our opinion, as this one is possibly as heavyduty as it gets before switching to the hardtop gazebos. Indeed, the poles themselves are elegantly thick. So much so that they have an aesthetic appeal of their own as opposed to most smaller canopies where the poles simply stick into the ground and are largely unnoticed if it weren’t for the fact that they prop up the entire ensemble. All in all, this is a well rounded and versatile gazebo with an easy to integrate design that will satisfy anyone looking for endurance, imposing stature, and indulgent spaciousness. If you want to see more gazebo options, you should check out our section on hardtop gazebos. Our review of the best hardtop gazebos will detail some of the favourites we’ve found. The hardtop gazebos, like the name implies, have a hard roof made out of solid material. They are generally sturdier and more heavy-duty. As one would expect each type of gazebo comes with its pros and cons, so in case you are undecided about what to look into, here’s what you need to know about backyard gazebos.